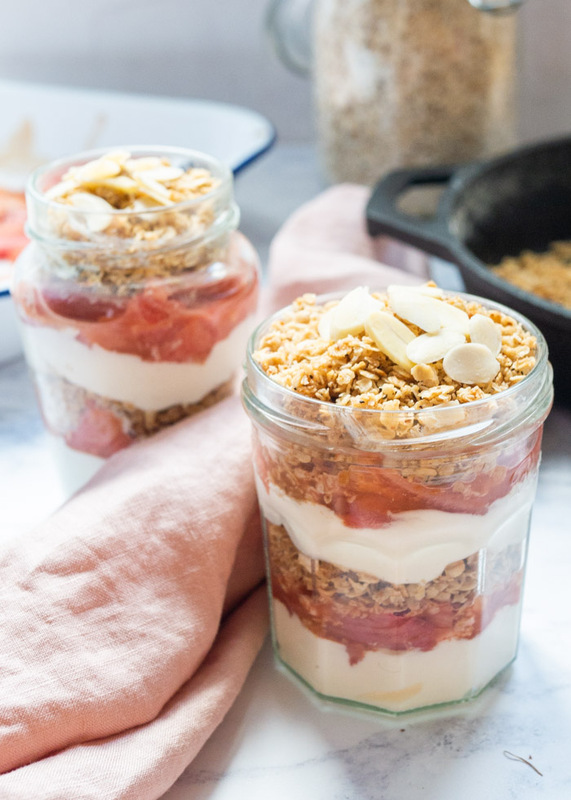 This Breakfast Parfait with Yogurt and Toasted Oats is so quick and simple to throw together, even on a busy morning. You can use whatever fruit is in season, so it’s adaptable to any time of the year and any tastebuds! This easy breakfast recipe is vegetarian but could be made vegan in a snap. I think there is only so much porridge you can eat in Winter. Yes, it is warming, comforting and almost perfect in every way but after a while, I kind of just want more texture. 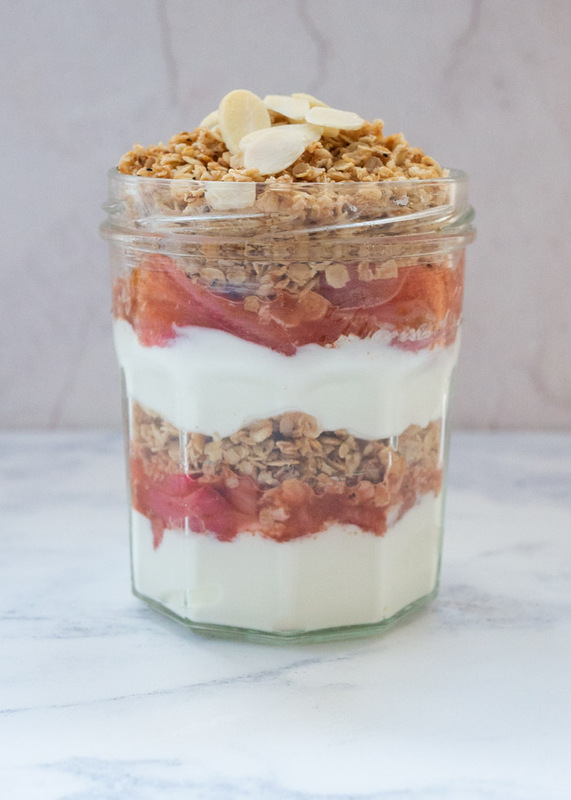 A little bit more crunch, something a little lighter, something like this Breakfast Parfait with yogurt! 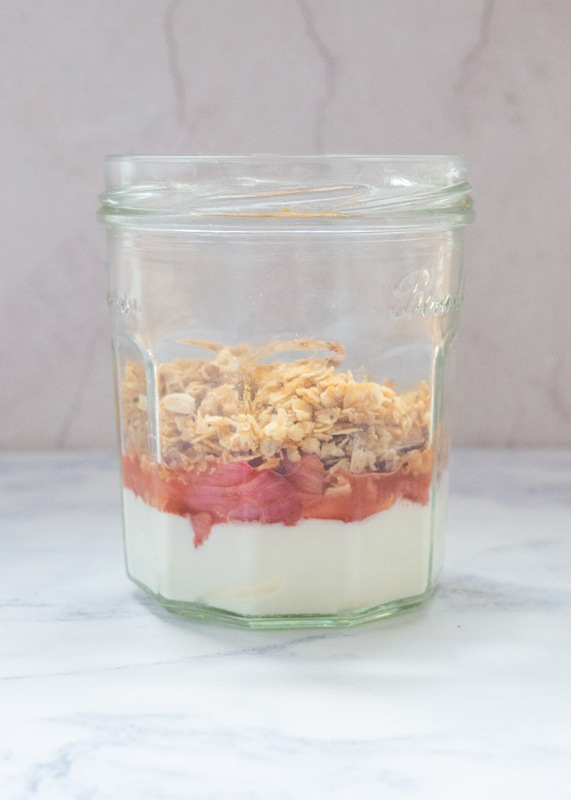 Instead, we have plain Greek yogurt with nutty, toasted oats cooked with a little honey and butter, layered with that tangy roasted rhubarb. You could 100% go with raspberries (maybe try my raspberry flax jam?) or any other kind of fruit but forced rhubarb is in season right now and it is delicious. 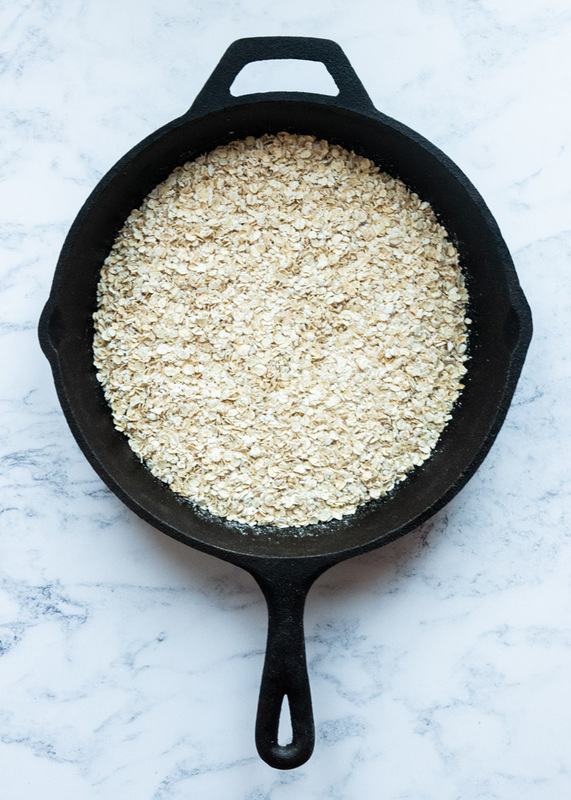 Add your porridge oats to a frying pan and turn the heat on to medium. 2. 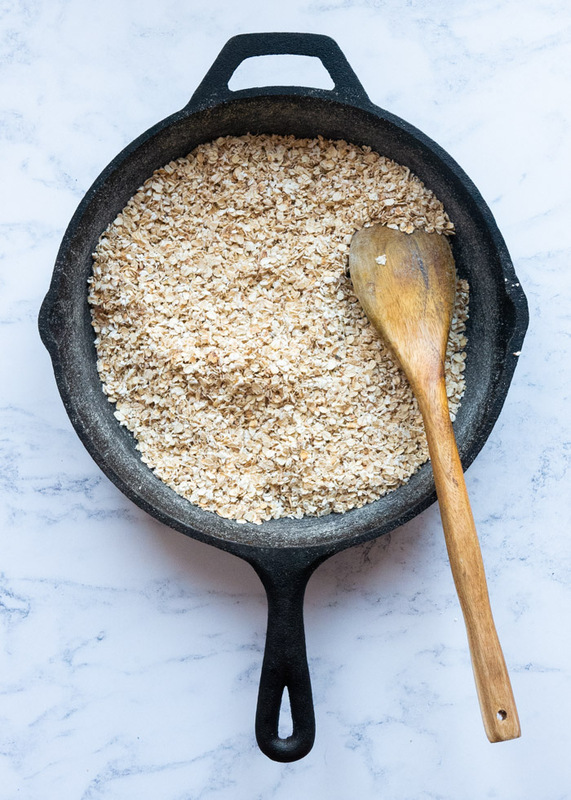 Stirring regularly, toast the oats for 5-7 minutes until they are golden brown. Keep a close eye on them so they don’t burn. 3. Add the butter and honey to the pan and allow the butter to melt. 4. 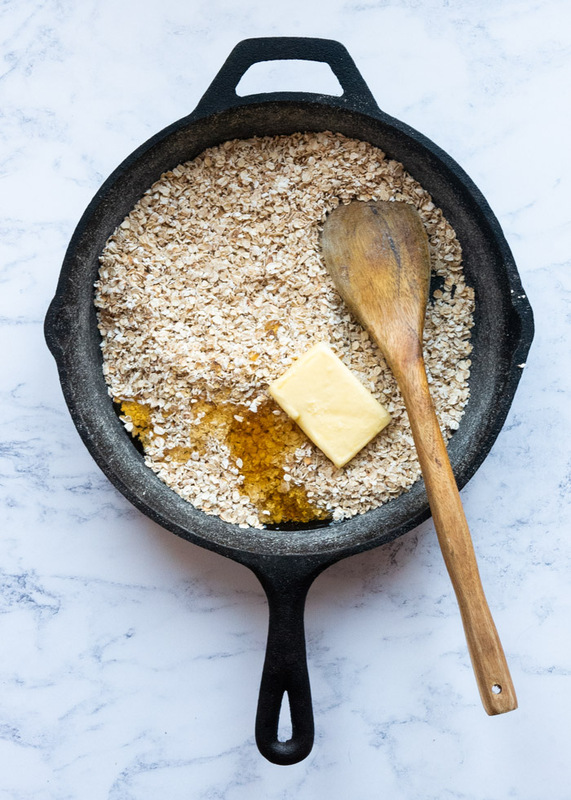 Stir everything together until the oats are evenly coated in melted butter and honey. Leave to cool. 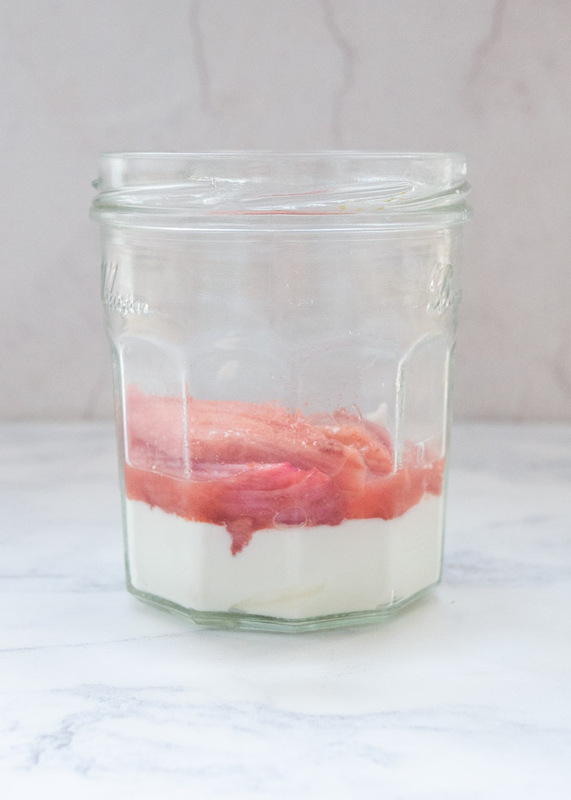 Add a layer of yogurt to the bottom of a jar or bowl. 2. Spoon on a layer of fruit. 3. 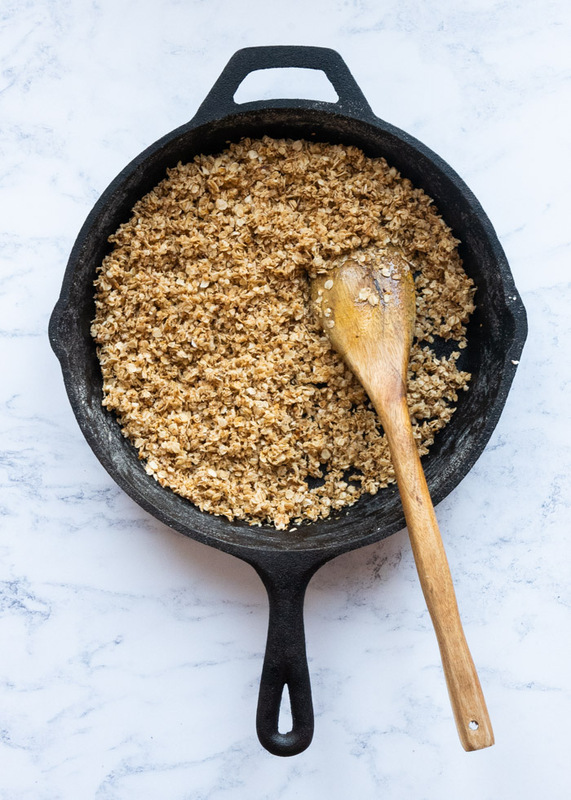 Add a layer of toasted oats. 4. 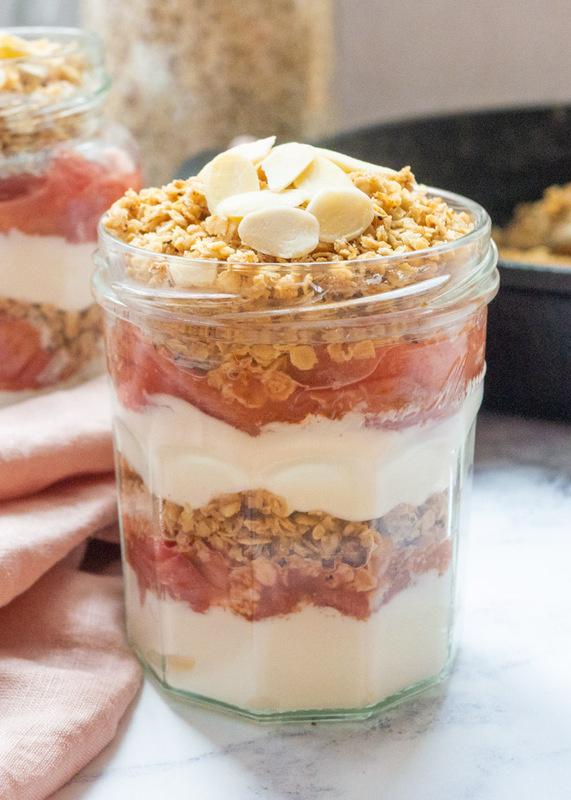 Repeat the layers of yogurt, fruit and toasted oats and finish with some flaked almonds. Can parfait be made ahead of time? Yes! These will last 2-3 days in the fridge, but the toasted oats will lose some of their texture. 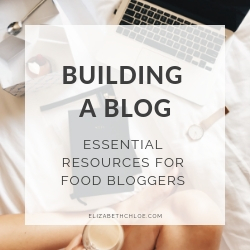 Instead, I would prepare everything separately – chop your fruit, prepare the toasted oats and portion out the yogurt into jars, bowls or Tupperware. 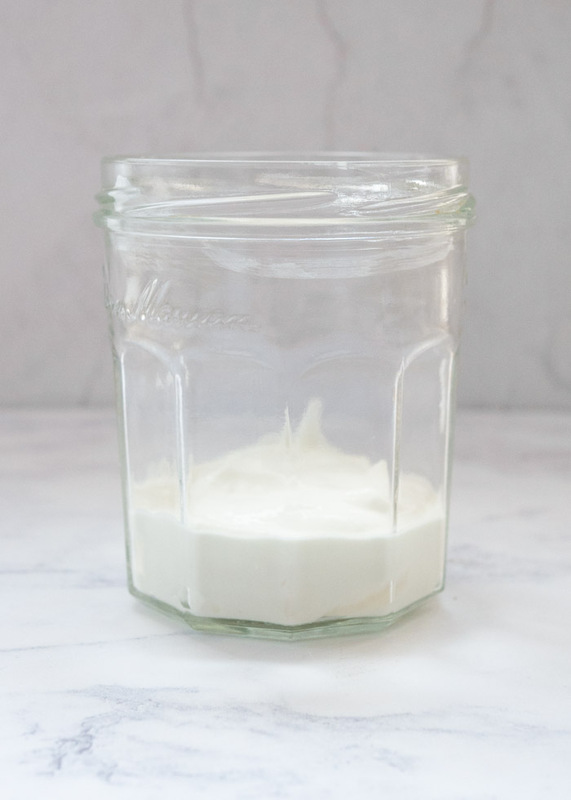 Store it all separately (fruit and yogurt in the fridge, toasted oats in a sealed container in the cupboard) then when you’re ready to make it add everything into the yogurt jars in layers. Creating the parfaits when you’re ready to eat them means the toasted oats will still have great texture and they will be ready in minutes. Store the parfaits in air-tight Tupperware containers or lidded jars in the fridge for 2-3 days. The toasted oats on their own will last 4-5 days in cool, dark cupboard. Can breakfast parfait be adapted to be vegan? With a few simple swaps, this recipe can be suitable for vegans. Or your favourite dairy-free alternative! 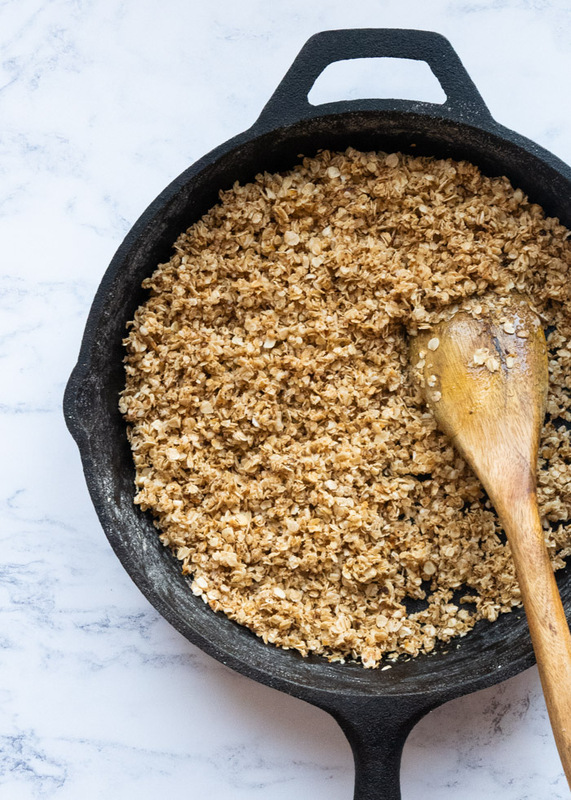 These toasted oats are cooked in honey and butter. I use roasted rhubarb which is roasted with some honey. You could make this recipe vegan by roasting the rhubarb with one of the vegan sweeteners mentioned above, or just use whichever fresh fruit you enjoy! I would eat the granola by itself. This sounds like a great way to start busy mornings. What a great breakfast or snack! Easy, light and flavorful! I love it! I love rhubarb, but never thought to have it as part of breakfast – great idea! It looks so delicious! What a beautifully presented treat.. 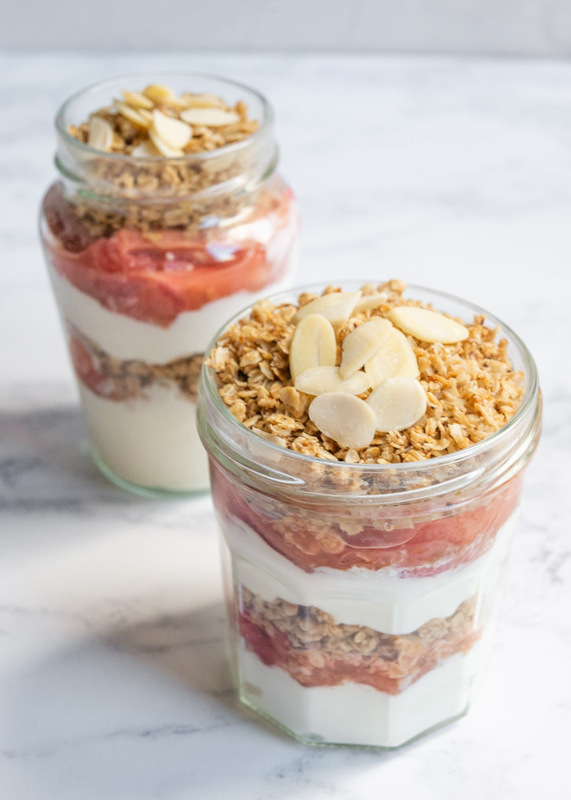 I love how you used the clear jars to show all the layers of the parfait! Thanks for sharing. These are SOO good! I just made them for breakfast and my husband and I loved them! Thanks for an awesome recipe! Now, this is my kind of breakfast! 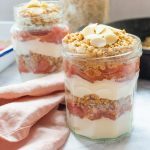 I love a good breakfast parfait but have never had one with rhubarb, definitely trying this! Let me know how it goes, Michelle! This breakfast parfait looks so good! I love the layers of fruit with the toasted oast, looks delicious! This is such an awesome recipe! Thanks for taking the time to explain how to toast oats …because I totally would have just thrown them in untoasted, lol. Can’t wait to make this! Aha I feel you, Krista 🙌 Untoasted would work, but the nutty flavour after toasting them is just so good! What a fabulous way to use oats!! I love this new spin on porridge! I agree….sometimes I just need a little something different!!! Such an easy delicious breakfast! 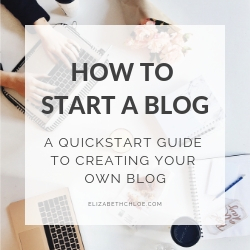 I love that you added toasted oats, I’ve got to try this soon! Let me know how it goes, Andrea! I’ve never eaten rhubarb before, but I do really like raspberries. This looks like a perfect on-the-go breakfast! Raspberries would be so good in this recipe! Rhubarb is delicious but it can be very tart! This looks like it would be so perfect for breakfast. I hardly eat breakfast because I do not like to eat anything super heavy. I’m not a fan of heavy breakfasts either Becca, this is just right!